Wishing all Spokes members, family and friends a safe, successful and fun cycling year ahead. Let’s use 2018 to lobby for safer routes, better understanding between all road users and more practical cycling facilities in east Kent. 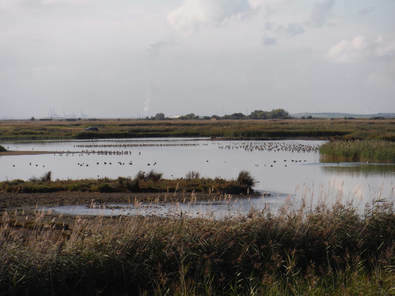 ...or cul-de-sacs in the Ham and Luddenham marshes. Meet at Faversham Station 10.30am for an easy ride of 15 miles (22k) with a pub stop. Suitable for all bikes. Enjoy the flat bleak marshes around Faversham. If you are a twitcher, bring some binoculars. If the weather is really terrible, a walk round Faversham is the alternative. Ride leader: Andrew Wyvers. Spokes members attended an Air quality workshop which took place on 8 December at the Canterbury City Council offices. That there is no safe limit for exposure to particulates. These are not currently the prime focus for air quality as N0x is considered to be the most concerning. Traffic movements in Canterbury have been more or less constant for the last 10 years (about 160,000 per day) and the Council intends to keep them at this level. This suggests that any additional traffic movements from new housing or other development will have to be dealt with by changing existing transport or encouraging alternatives or both. It helps council officers make the case for sustainable travel if they and the local MPs are made aware that there is growing pressure for change. In effect, they want us to campaign more! Overall, it was a good meeting - lots of energy plus lots of ideas, thoughts, suggestions from the participants which the council will look to include in their air quality management action plan which will be going out for consultation in April 2018. It was also good to see council officers want to make real and lasting changes. Copies of the notes from the meeting and the opening presentation are available and a copy of the council's transport strategy can be downloaded from their website. People don't cycle around Canterbury because they don't feel safe. Cycle routes aren't well connected and are hard to follow because of lack of clear signage. Cyclists are continually confronted with 'cyclists dismount' and 'end of route' signs. A practical way to help the council is to design a tube map that illustrates the quality of the current cycle network. A map illustrates easily where a desired network of infrastructure would be best placed and what the current quality of the network is. Local authorities across the country are being asked to draw up network maps to support funding bids. By drawing a tube map, you are starting the work for the local authority and cyclists can ask for better facilities. Spokes would be interested in compiling a tube map but needs input from members - if you'd like to contribute to this, please contact us. For more information about cycling tube maps see https://www.cyclinguk.org/guide/make-tube-map-cycle-network. 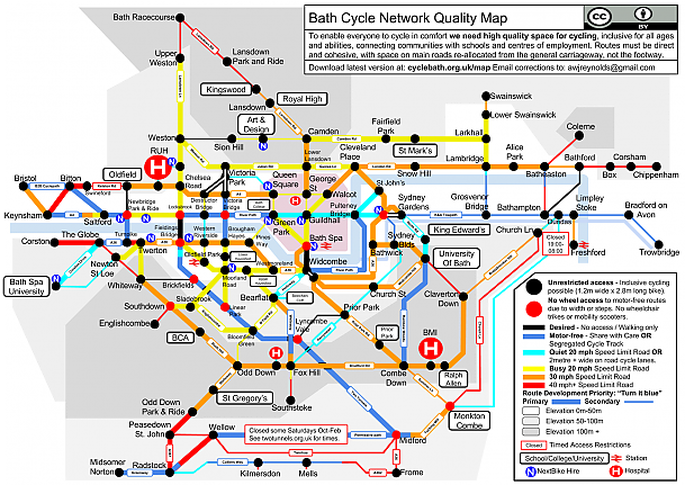 The illustrative map below shows a tube map for Bath. David Taylor, former chair of Cycle Shepway and one of our AGM speakers a few years ago, died recently after a short battle with cancer. Although David was not the founder of Cycle Shepway, he provided much of the energy and drive behind it in recent years. Always busy, he was a trustee of a London charity and did much local work for his community association.